Each year millions of travelers stream through the gates of Costa Rica’s Juan Santamaría airport en route to one of the country’s many natural wonders. But often when tourists leave, a piece of the country’s biodiversity goes with them. Turtle shell bracelets, reptile-skin wallets, bird feathers and even live animals have all been snuck out of Costa Rica through the airport as souvenirs. But the uneducated tourist is just the tip of the illegal wildlife trafficking iceberg. 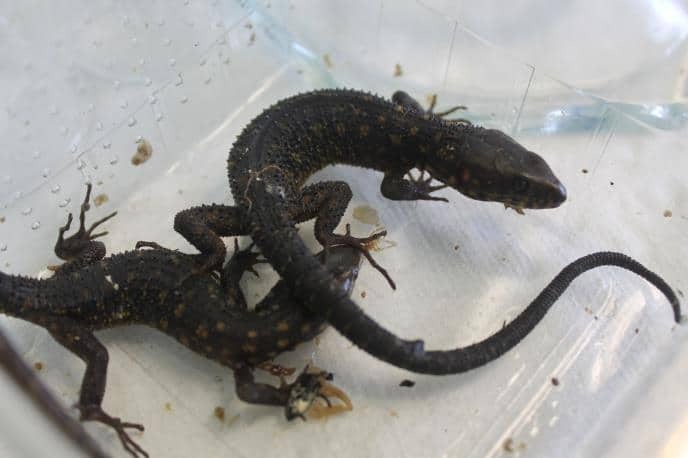 Professional smugglers slip unknown amounts of wildlife out in passenger planes at Costa Rica’s main airport, and exporters are known to sneak illegal wildlife into legitimate commercial shipments. Wildlife traffickers of either type are rarely caught, and when a seizure is made, penalties are low. Security at the San José airport relies on x-ray machines and body searches to uncover whatever wildlife may be secreted away in suitcases, while customs officials are saddled with the enormous tasks of distinguishing souvenirs from contraband, and legal wildlife exports from fraudulent ones. In both cases, there is plenty of room for illegally transported wildlife to slip through the cracks. 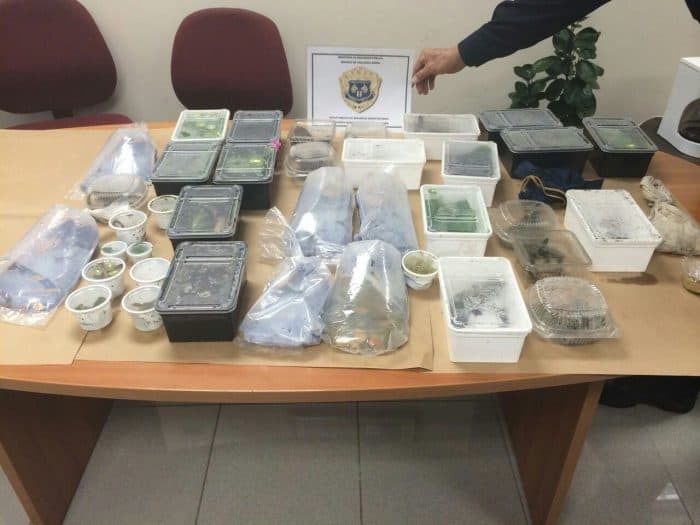 Last September, German tourist Maciej Oskroba showed up at Juan Santamaría Airport carrying a bag full of dirty t-shirts, swim trunks and more than 400 live snakes, frogs and lizards stuffed into poorly ventilated plastic food containers. Oskroba planned to board a plane to Panama en route to Dusseldorf, Germany, where he likely would have sold off his collection. But airport security discovered his hidden menagerie and detained him before he could leave the country. The case was deemed the largest animal seizure at the airport in the last 20 years. With the demand for exotic pets in the U.S. and Europe, the incentives for wildlife smugglers are high. Oskroba’s animals were potentially worth tens of thousands of dollars. Just one of his hundreds of frogs could have fetched $50, one of his snakes up to $300, in European markets. While frogs and small reptiles are the easiest to slip through security, some traffickers are bolder. Carlos Víquez, the head of security at Juan Santamaría said he has seen numerous cases where smugglers have hidden hummingbirds in specially sewn pockets in their clothes. In one case, security caught a man attempting to transport two live coatis in a wooden crate — these small racoon-like mammals are favorites among exotic pet owners. There is no special protocol for detecting wildlife smuggling at Juan Santamaría. Oskroba was caught after an observant security guard noticed him repeatedly checking the inside of his bag. Under normal circumstances, airport security relies on metal detectors and x-ray machines to catch smugglers. But just as with any other type of contraband, there are ways to conceal wildlife from the machines. “Some animals go out in suitcases, but [traffickers] usually pack them on their bodies just as you would if you were smuggling drugs,” said Dennis Janik, the founder of ZooAve, Costa Rica’s largest wildlife rescue center. But unlike drug trafficking, wildlife smuggling laws are rarely enforced to their full extent. Costa Rica criminalized trafficking animals in 2012 and perpetrators can face hefty fines or up to three years in prison, but no one has ever served the maximum sentence. In fact, most wildlife smugglers hardly face any penalties at all. Oskroba, though caught in Costa Rica’s largest wildlife smuggling bust in recent memory, was released from jail after nine days with no fine. After missing his flight, he was deported back to Germany on the Costa Rican government’s dime. Oskroba, like virtually every other animal trafficker caught at the airport, was able to take advantage of the so-called “flagrancy court system,” which allows first-time offenders to pass through an expedited court process. The flagrancy courts only take cases where the offender was caught in the act, making the evidence irrefutable. In these cases, a first-time offender facing a maximum penalty of three years or less can plead guilty in return for one year of probation. Since smugglers are almost always caught red-handed, this is how almost all wildlife trafficking cases proceed, according to prosecutors. For a smuggler to face the mandated fines or prison time, they would need to get caught twice within one year. But even reaching trial is rare for wildlife runners. Víquez says he has only seen four cases reach a courtroom in his 20 years with airport security. Most cases are dropped, and officials believe that the vast majority of wildlife smugglers simply do not get caught. In November 2014, more than 400 kilograms (880 pounds) of hammerhead shark fins rose into the air over Costa Rica, carried in the bowels of an American Airlines jet bound for Hong Kong, where it would become the key ingredient in the Asian delicacy known as shark fin soup. In February 2015, the Costa Rican government authorized the export of several hundred more. For years, shipments just like these left Juan Santamaría Airport without comment, but this time was different. Shark fishing is legal in Costa Rica, but in September 2014, two months before the first shipment, three species of hammerhead sharks were added to Appendix II of the Convention on International Trade in Endangered Species of Wild Fauna and Flora, known as CITES. This international agreement protects species threatened by extinction from commercial exploitation — wildlife listed on Appendix II cannot be exported by member countries, unless governments provide studies showing that the trade won’t be detrimental to a wild population. The two Costa Rican shipments took place before any such studies were conducted, a CITES violation, according to conservation groups. It’s a particularly egregious offense considering that Costa Rica was the lead country in proposing the addition of hammerheads to Appendix II. 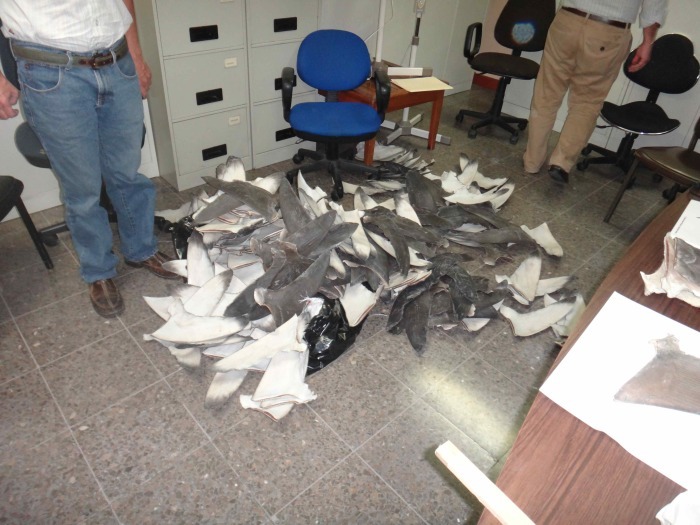 Investigations into the shipments showed that customs officials were unsure how many fins had been exported due to the lack of a comprehensive traceability system. The exports set off a firestorm of protests in Costa Rica and prompted American Airlines to ban shipments of shark fins on their planes. The government has since placed a one-year moratorium on the export of hammerhead shark products, but the controversy drew attention to a long-standing problem at Juan Santamaría. Instead of marking and tracking specific fins, Costa Rica’s fishery authorities simply weigh them to determine how many a company can export. They weigh the legal fresh fins on the docks before they go into frozen storage. In storage the fins lose 70 percent of their weight, so the company is then allowed to export 30 percent of the original weight landed at the dock. The fins are not counted or registered by species. The system leaves ample space for more fins to slip through the legal loophole, and marine conservation NGOs estimate that at least a few banned endangered sharks’ fins slip out in each large shipment. It is not only shark exports that are poorly monitored. According to Coghi, very few of the wildlife exports in customs go through a physical inspection by an expert. As long as the paperwork appears to be in order, customs will allow most shipments, even when there is no way to prove that what is being shipped is the same material described in the permits. According to Coghi, this system extends to live animals. Someone looking to export a Costa Rican sloth or snake through legal channels needs only a document from the Environment Ministry that says the animal was not captured in the wild. There is virtually no way to prove whether a particular animal was legally captive-bred or illegally plucked from its natural habitat. Costa Rica’s failure to provide adequate wildlife trafficking safeguards isn’t unique. Laws in Brazil, Venezuela, Ecuador, Peru and across Latin America are riddled with loopholes. Oversight and enforcement are weak, and when smugglers are caught, they mostly go unpunished. Meanwhile, rainforests and seas are being emptied of wildlife in a growing crisis that demands action, but which isn’t getting much attention.